Imagine taking your vows barefoot on the beach on Martha's Vineyard. 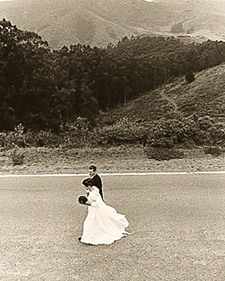 Or dancing your first dance by moonlight beneath olive trees at a Tuscan villa. Or exchanging your first official kiss as husband and wife in the town where you grew up. For many engaged couples, the very idea of a wedding is linked to a particular location that's far from where they live right now. But before committing to planning a wedding at a distance, consider this: You will sacrifice some control over the details. You can't taste the hors d'oeuvres four times, for example, or try out three different centerpieces to see how they will look at the reception site. Whether or not you'll enjoy the experience of long-distance planning depends largely on your personality; if you're meticulous and detail-oriented, it may not be for you. If, on the other hand, you enjoy delegating (and being surprised), what you stand to gain is the sense of being truly transported to another world for your wedding. You may think you've already found the perfect spot for your wedding, but before booking anything, do your homework. Talk to newly married friends, even borrow their planning books, so that you have a sense of what things will cost you and what is involved; no one understands the complexity of a wedding as well as someone who has just been through one. When you're establishing your budget, be sure to add transportation to your destination, including at least one trip before the wedding; hotel accommodations; and expenses for a band, photographer, or officiant if you choose to bring any of them with you. If your budget is tight, consider being flexible about your wedding date; you might have avoided January and February, but these months are a great time for island weddings, and elsewhere they are considered off-season, so rates of coordinators and most vendors are discounted as much as 20 percent. After working out a budget, establish a very clear idea of what you want the day to be. Tear out magazine pictures of dresses, cakes, receptions, and flowers, and keep them in a folder. When you can't meet with vendors in person, a picture is truly worth a thousand words. As soon as you're sure you can pull off a destination wedding, consider sending out save-the-date cards. If your guests will need to book flights to the reception, give them as much advance notice as possible not only to allow them to arrange their schedules but also to take advantage of frequent-flyer miles. You may also want to consider setting up a wedding-day website and email address early on so your guests and vendors can communicate with you through one central place and you aren't bombarded with phone calls and email at work. If you have friends or family in the area where you'll be holding the celebration, consider yourself lucky. Nicole Stone relied on family ties when planning her Spring Lake, New Jersey, wedding to Peter Faherty while both were living in Minneapolis. Because Faherty's uncle has a weekend home in Spring Lake, the couple had lots of recommendations for good vendors in the area. Stone's parents were also able to make several trips down from their home in Greenwich, Connecticut, to sample food, look at flowers, and take care of other details. "If I had not had such a strong network of family and friends in the area, I don't think I could have done it without the help of a professional wedding planner," says Stone. Indeed, as Stone realized, the next step for a bride is to decide how much of the planning she wants to do herself and how much to delegate to a professional. If you choose to make the arrangements yourself, the local tourist bureau at your destination can be a good place to begin. Perhaps you already have your eye on a hotel or club, in which case the concierge or manager may be able to recommend florists, photographers, and bands in the area. If your destination has a strong cultural heritage, consider including local music, food, and decorations in your celebration. When calling your vendors, ask for references, and take the time to check them. Testimonials mean everything when you have to make decisions from a distance. Once the reception location is set, you can do much of your scouting by phone, e-mail, and mail. Many photographers now have websites where you can view their portfolios online. (If the photographer's online images are low quality, however, ask them to mail their books.) Bands can send demo tapes that you can listen to at home. When it comes to flowers, your best bet may be to provide the local florist with pictures of what you want your bouquet and centerpieces to look like, and ask him to replicate them. You can even ask him to do a sample bouquet and send you a photograph. Don't be afraid to keep going back and forth until it's exactly what you want. If you need to arrange for linens, you can often visit a rental company in your area and then just place your order over the phone; most companies carry the same color and pattern choices. Finally, call the local registrar's office and ask if someone there can mail you the paperwork for your marriage license. Many brides find that hiring a professional wedding consultant makes long-distance planning easier. Consultants can take care of as much or as little as you want them to, depending on your needs and your finances. They can assist you in scouting for a reception location, and in finding a photographer, florist, caterer, and band. Once everything is booked, they can oversee the day-to-day management of the vendors, a very time-consuming task. They can also deal with obtaining the marriage license and find out if you need shots or blood tests (the requirements vary widely from state to state and country to country). If you're traveling out of the country, they can investigate customs details, which can be tricky, particularly if you are bringing a photographer along who will be traveling with equipment, or if you plan to send a cake or other food items. A good planner will know to do this, but if you're making these arrangements on your own, get the customs clearance information in writing so that you can avoid having equipment or supplies detained or even confiscated at the airport. You can also hire a consultant to perform only certain tasks. Valerie Latona and David Contract, a New York City couple who planned an island wedding from New York, arranged for a consultant to be on call the day of the wedding to make sure everything ran smoothly. But during the planning process they also found that they needed her to perform various assignments like arranging for a local shuttle service to take guests from the hotel to the rehearsal dinner and helping to find a local steel-drum band. In a case like this, a planner will typically charge by the hour or by the project. Although it might seem logical to hire a consultant who lives and works in the destination where you'll be holding your wedding, sometimes selecting a professional closer to home can be more beneficial. One believer in this approach is Elizabeth Allen, a wedding planner and owner of Elizabeth K. Allen Event Planners in New York City and Atlanta. "The most important part of the process is the connection between the planner and the bride, and there are several intense upfront meetings that can be difficult if the bride is far away," says Allen. "Most of what we need to do with vendors can be done via phone, fax, and email." A good planner will have a broad network of contacts all over the country and even the world. When you are interviewing prospective consultants, be sure to ask them how much experience they have with planning long-distance weddings and how they handle travel. After all the details are set, make sure to leave yourself plenty of time to pack. Remember, you're not just packing for the honeymoon; you also have a lot to transport for the wedding and reception. It's safer to take your dress, shoes, and undergarments with you (the groom and wedding attendants should all be advised to do the same), rather than sending them separately or checking them onto the plane. If you are carrying your dress with you, call the airline ahead of time and let them know. Ask what arrangements they can make for you, particularly if you have to change to a small plane with little storage space. You should also plan to take with you any beauty products and accessories you intend to wear rather than risk not being able to find them at your destination. Last and most important, learn to delegate and accept help from others. Even world leaders will tell you they're only as good as the people around them. Planning a long-distance wedding may not be as challenging as negotiating a peace treaty, but it is no small feat. Your main job is to put the planning wheels in motion so you can relax and stay focused on enjoying this very special time.